Call MI6: A new supervillain must be on the loose. Someone has taken the essence of Adobe Photoshop, Illustrator, and InDesign (aka Adobe CS) combined it with cheetah DNA (the speedy animal, not the Mac OS), and started selling it as $300 software called Xara Designer Pro. Wait. That's not evil at all. If you've never before used Xara Designer Pro, now is the time to try it. Version 8, also known as Xara Designer Pro X ($299), combines most of the tools you regularly use in Adobe CS ($1300)---powerful photo editing, smart multi-page document layout, vector based shape creating---and rolls it into one fast program. In addition, Xara Designer Pro X includes all of the Web design features from Xara Web Designer MX (version 8; $50), and a slew of very useable--meaning you can dismember and re-assemble to your heart's desire--templates. The addition of a Text Styles feature builds on Xara Designer Pro's ease of use and great integration as a combined layout, photo, and text editor. 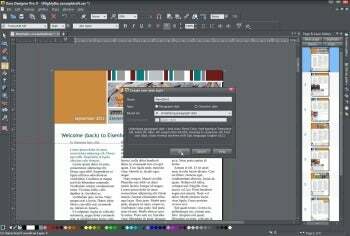 If you're upgrading from a previous version, Xara Designer Pro X will look and feel very familiar: The UI remains intuitive: click on most tools and the Infobar will automatically show you the options for that tool; when you're setting text, Xara works exactly like a word processor; and with images, you really can't mess anything up with the non-destructive editing. Xara (a subsidiary of MAGIX) has made a few improvements to Xara Designer Pro X (and slimmed-down sister product, the $90 Xara Photo & Graphic Designer 2013) including the addition of a Color Picker Tool that allows you to create a mask based on a color selection. There are also improvements to layout tools in Xara Designer Pro X: now you can set text styles easily and quickly, and manipulate your pages with drag-and-drop ease. They also share the new Eraser tool. There are a few things that still need some work: Xara Designer Pro X doesn't always play nice with Adobe Adobe Acrobat Professional—sometimes it just wouldn't create my PDF for me on Vista---but if you use PDF-XChange Printer 2012 (part of Tracker's PDF-XChange Pro 2012 $74 bundle) it works flawlessly. Using the Clone Tool in both Xara Designer Pro and Xara Photo & Graphic Designer MX is much like using two mirrors to cut your own hair: It's counterintuitive and overly fiddly, even with the version 8 improvements. And similarly, the color picker often is cantankerous. Plus the name is confusing. According to Xara, the X in Xara Designer Pro X refers to the professional line of products, rather than the Roman numeral for ten (this is version 8, and the first Pro package in the series). It's also not to be confused with the now-obsolete Xara Xtreme, sometimes known as Xara X.
I've used various versions of Adobe CS, Quark, PageMaker, even CorelDraw back in the day, but nothing comes close to the ease, speed, and logic found in Xara Designer Pro X. When you first begin to use Xara Designer Pro X, you may find yourself (as I do) frustrated because you can't find the menu with the submenu with the settings to change the … something. Then you realize that there is no menu with the settings because the tool's Infobar is right at your fingertips. Learning curve aside, Xara Designer Pro X is undoubtedly a professional program, which for most people would absolutely replace a program like Adobe CS. No call to MI6 necessary. This all-in-one photo editor, drawing and illustration tool, page layout, and website design program is a good buy.